THE Mayor of Derry City and Strabane District Council, Councillor John Boyle is looking forward to welcome the Clipper 2017-18 Round the World Yacht Race to the city as the first of the yachts are set to arrive in Foyle Port from around 12 noon today, Monday 09 July. The Quayside will be a buzz of activity as crowds turn out to welcome the first of the eleven ocean racing yachts as they sail up the River Foyle and into Derry after a tightly fought race from New York. Speaking ahead of their arrival into the city this week, Mayor Boyle says he is really excited about welcoming the fleet to the city after the completion of Race 12: LegenDerry Race, for a two-week stopover before they depart on Sunday 22 July for the final race in their round the world adventure as they head towards Race Finish in Liverpool. He urged locals to come out onto the Quay on Monday at 12 noon to welcome the first yacht into port. Thousands of people lined Derry Quay to welcome the Clipper fleet in 2016. He said: “I am particularly looking forward to welcoming the two Derry participants – Conall Morrison Skipper of the HotelPlanner.com team and teammate Roseann McGlinchey from Lifford - as they prepare for a warm welcome home. 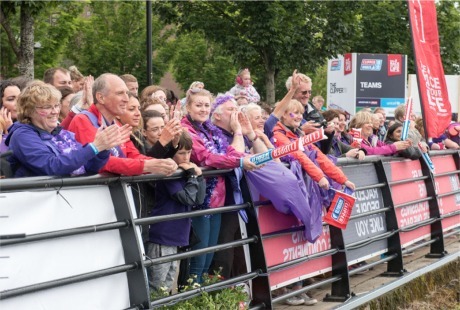 It is our opportunity to come out and show our support for them and thank them for representing our city and region in the Clipper Race and doing us proud." Mayor Boyle says he expects it to be an emotional arrival as the crews will be greeted by friends and family. “We’re anticipating a very busy week ahead with a packed programme of family entertainment and a whole host of activity on both the river and at various locations throughout the city. I’m looking forward to welcoming visitors here for this huge celebration of our maritime heritage and what promises to be the highlight in the summer events calendar,” he added. Lifford born Roseann McGlinchey is looking forward to seeing family and friends when she sails into Derry. The celebrations will get into full swing on Saturday July 14th, continuing to Sunday July 22nd with a wide array of activities on land and water. The main highlight of the festival will be the showcase event on the Friday night, June 20th which will be a spectacular outdoor finale event on the Foyle from 9 pm to 11pm, before the fleet depart in a magnificent Parade of Sail on Sunday 22 July at 1pm. For further information on the Foyle Maritime Festival and a full programme of events visit www.foylemaritimefestival.com .